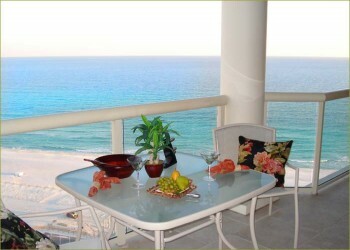 Situated in Tower 5 on the 19th floor, a grand luxury, gulf front two bedroom Pensacola condo for rent by owner in the beautiful beach and bayside Pensacola Resort. This exquisite rental features a sophisticated but calm and casual decor with a Rosemary Beach theme including a rich, apple-green swede sofa which folds out into a new and very comfortable queen-sized sleeper sofa. Both master suite bedrooms give guests private access to the balcony facing the gulf. Long private balcony stretches from the master to the guest bedroom and includes a table, chairs and built-in BBQ grill. Sunrise is unforgettable! Wonderful for families or couples on holiday at the seashore!